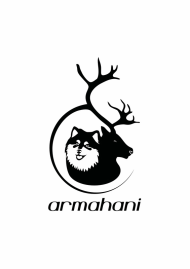 There has been a long period of anticipation for the first litter born at Armahani! This was always planned between my handsome first Lappie, Kulta, and my beautiful import girl, Emmi, brought to Australia to become my foundation. The puppies were born the day before Christmas Eve, with the last two being surprises when a litter of only five was expected. 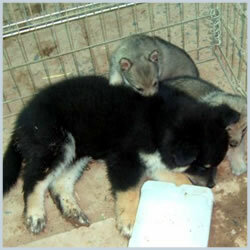 All seven, four males and three females, are black and will have clear markings with various amounts of white. Given they are Christmas baby reindeer herders, it seemed only fitting they have Santa's reindeer nicknames while they are here! Kulta, is a handsome, magnificent boy. He is structurally very sound, with lovely type, a stand out strong, masculine head and expression, and true and effortless movement. He has clear markings, with a large white chest, and a luxurious guard coat. He has quite a laid back and gentle personality and adores children, but is confident and loves being the centre of attention! Emmi is a stunning, gorgeous feminine Finnish Lapphund, imported from hugely successful Finnish show lines. She is of excellent type, with amazing substance, coat, structure and true showmanship. She has a drop dead beautiful expression with a perfect correct head. She has a very loving and confident personality with a dash of cheekiness! She has had some enormous success in the show ring. Billy, known as Donner while he was here, was the first born boy. The biggest teddy bear looking pup he was also big on his cuddles. As he grew, his very handsome head and lovely conformation caught my eye more and more. The splitting image of his uncle in Finland as a pup, we hope he will have just a small measure of the same success in the show ring. He is owned by Kelly and Steve Johnston and family, and we wish them every success with him. Tanssija, the Finnish translation of her call name Dancer while she was here, was the first born girl and the one that Emmi was just fascinated with from the start. She quickly grew into the pup with the prettiest face and head, and like all the girls, is just stunning in conformation. She is the girl who looked the most like Emmi as a puppy. She will stay here for four more weeks before heading off on her big adventure to live with my friend Kit Brillinger. We hope in a generation or two's time her progeny will come to join us again. Lahti, known as Vixen while here, is the puppy that quickly caught my heart. She lived up to her name very quickly, beng the one exploring the whelping box from her first week, and continued to be the most curious and cheeky puppy. A very pretty girl, with such attitude, I couldn't bear to part with her, and while she will live and be loved by the Field family, we hope that she will join us on special occasions in the show ring and, all being well, will come back to Armahani for a litter when grown. Mitch, known as Prancer while here, was the smallest boy, but certainly kept up with his brothers in the playing stakes. A very affectionate, cuddly boy who just loves his tummy rubs and lives for a game, he is heading off to be loved and adored by Mark and Mary Frances Ferguson who I just know will absolutely adore him. I don't know what I am going to do without him to snuggle up to once he is gone! Katrikki, Comet while here, is just the prettiest thing you can image! While very young, I thought she was going to be quite the soft girl, but as she grew, her attitude sure came to the front, and like her sisters is cheeky and bold like their mum. She will be living with the McRae family, who have waiting a very long time for their own special girl and have already started joining us on Lappie picnics even without their own pup! I look forward to seeing her at my own club's puppy preschool over the next few weeks and watch how she grows. Zion, known as Dasher while he was here, is the puppy that had me laughing constantly as he grew. Full of mischief, just delightful in temperament, the first to run to visitors for cuddles, with a bit of a wicked streak, this happy go lucky chap really won the heart of everyone here. He will be heading off to live with Mandy Shadforth and Sam Williams, and to play on the beach with Peaches, and I know he is going to have a grand time being loved and adored.